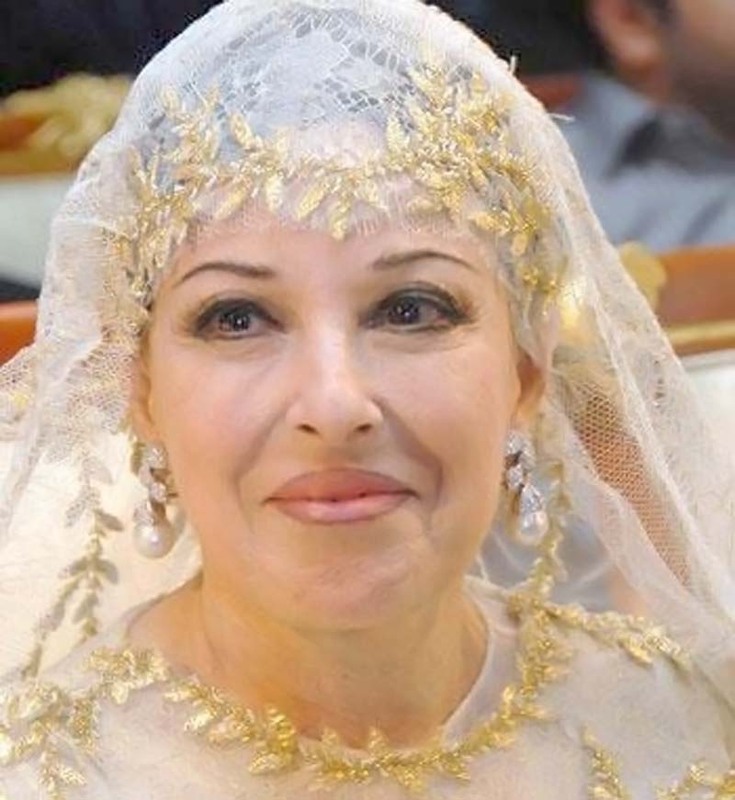 She was an Arabic actress and singer retired in 2002. There are those who claim to have seen the same video of the same song 200 times! Others regard Najat Al Saghira as the most beautiful woman in the universe! Many are dazzled and mesmerized by her performance on stage. A date (year) is given for each photo. Number of asterisks refers to the possible accuracy of the given date. No asterisk means the shown date is likely accurate; otherwise: (*) refers to +/- 1 year margin of error and (**) refers to +/- 2 years margin of error. 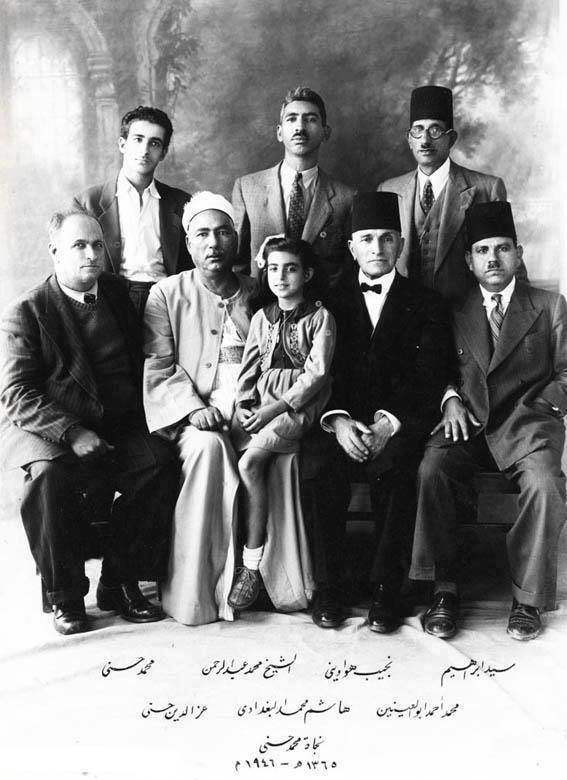 1943 (*): The Beginning: Najat the child standing on stage and behind her is her musicians and siblings, from left to right are her brother Ezziden (only his left hand is visible), her brother Farooq and her sister Samira (the fourth boy on extreme right is unidentified). 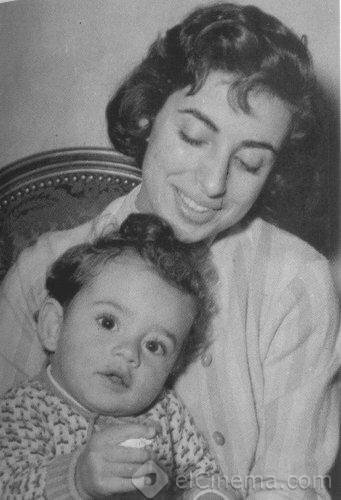 Najat was born in Cairo into an “extended family” in August 1938. God blessed her with wonderful voice and great beauty. She was singing in family gatherings at the age of 5 years. She made her first film Hadiya (released in 1947) at the age of eight. Her father was Mohammad Hosni. He was originally Syrian with Kurdish roots. He settled, lived and died in Cairo. 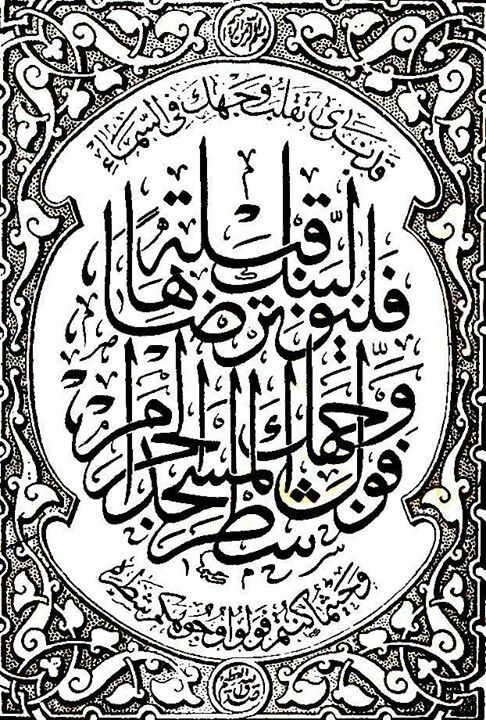 He was a respected calligrapher as can be seen from the couple of samples shown here: one is the first part of verse 2.144 in the Quran and the other is a Hadith (statement by the Profit peace upon him). He was married more than once. Najat’s mother was Egyptian. The household of her father was known as “the home of the Artists”. His son Ezz Eddin Hosni, is a music composer. His other son, Sami Hosni, is a Cello player, jewellery designer and also calligrapher. 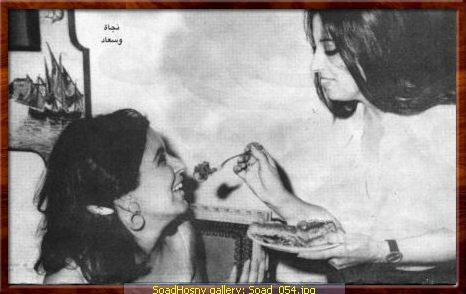 Soad Hosni (1942-2001) is the half-sister of Najat. Soad died in London under controversial circumstances. Soad performed in more than 80 films the last of which was released in 1991. She had four (possibly five) marriages and had no children. She died whilst still married to her last husband, script-writer Maher Awad, whom she married in 1987. Mohammad Hosni had several marriages and divorces. Both his daughters suffered marriage failures. Soad’s dentist in London said, in a TV interview after her death, that Soad told him “Art destroyed my life”. Najat had two (possibly three) marriages. It appears her first marriage was at young age, in 1955, when she was 16 (or 17) years old. Najat divorced her last husband in the 1970s and has remained single to date. Media reports suggest that she made a decision to devote her life to raising her only child, Waleed, and to her work. In the first 10 years of her singing career Najat imitated other singers. Renowned Egyptian journalist Fikry Abatha (1896-1979) demanded the State should support this young girl and insure proper development of her gift. According to her family that period “trained” her voice. However, in 1949, music composer Mohammad Abdul Wahab (1902–1991) actually filed an official complaint at the Police station against Najat’s father. He claimed that such training hindered the natural process of her voice development and that she should be left alone to develop freely without it. Najat’s stage performances are the core of her legacy. 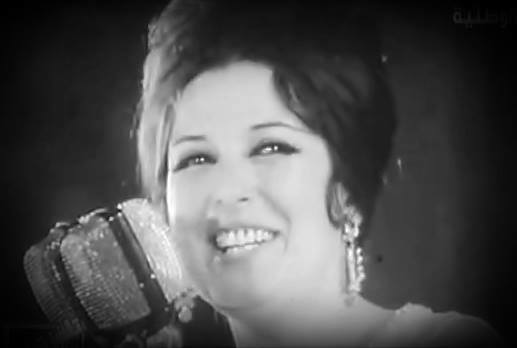 Kamal Al Taweel (1922–2003), one of her distinguished collaborators, said in a TV interview that as far as music composers were concerned “Najat was the best performer in the Arab world”. 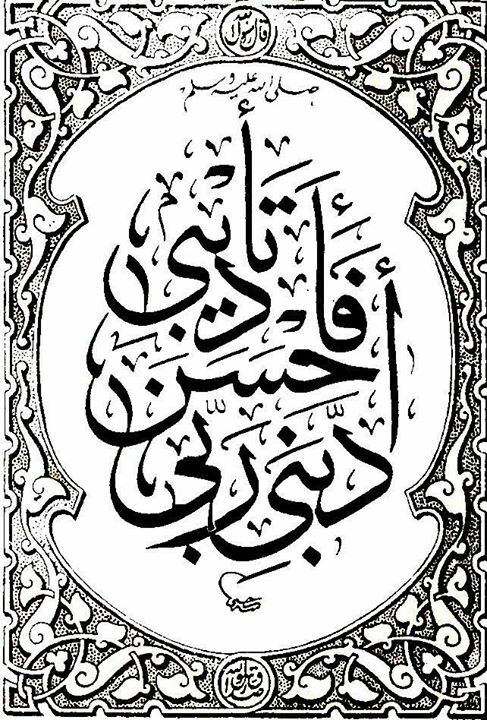 This statement puts Najat in effect as No.1 arguably ahead of Um Kalthum (1898–1975); still widely regarded by many as the greatest Arabic singer in history. 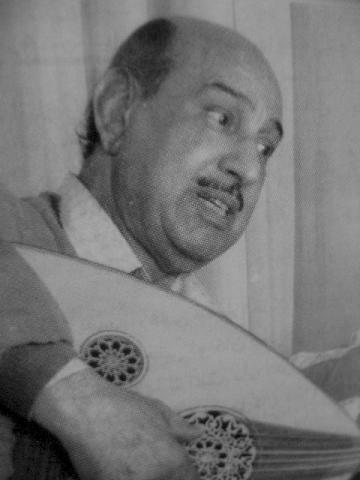 Mohammad Abdul Wahab, the most prominent 20-century Arab composer, felt his works were safest with Najat. 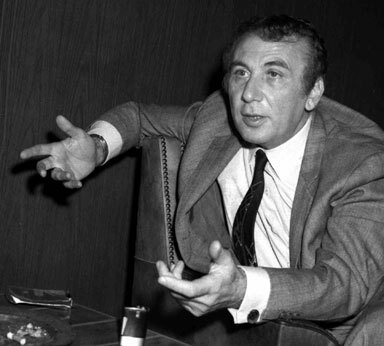 Nizar Qabbani (1923–1998) a Syrian diplomat and one of the most revered contemporary poets in the Arab world said, in a TV interview that he hoped to attract some 15 thousand readers when he published a book of poetry, but when Najat sang one of his poems it attracted millions in the Arab World. To my knowledge, there is only one recorded interview with Najat. 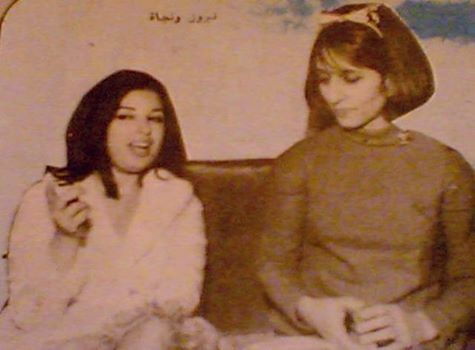 It was on screen in 1960s; possibly in 1964 for Egyptian TV to the presenter Ms Salwa Hejazi. This interview was relaxed and informative. It was conducted in Najat’s own apartment. Let us call it the “1964 interview”. She stated that she had, at that time, eight brothers and sisters. Currently (2015) some media outlets are indicating double that number; the most frequently mentioned is seventeen brothers and sisters! Salwa: Did you experience any deprivation in your life? Najat: There was a time whilst still a child, on stage, when I felt the responsibility of a waiting audience. This was a type of deprivation I have experienced. I do not recall playing with a doll or having my favourite red colour as normal children would do. But, I have tried to compensate and am still compensating through playing games with my son! Najat‘s son was with her at this interview. He was eight years old. Salwa: There is a complaint about you which we regularly receive from your fans! Najat (embarrassed): What is it? Salwa: Shortage of your works. People are asking for more songs from you. Najat: Yes, I cannot deny it. But, it is not easy to find quality lyrics, music and sufficient time for training. It is a lot of hard work. If it was up to me alone I am ready to sing up to ten times a year if I can get the quality words and the right music compositions. Najat: Recently I went for a drive accompanied by some of my friends and relatives to see a film in Cinema “Metro”. Salwa: You drove the car! Najat: Yes. Normally my brother or the driver drives it but not this time. Upon arrival, we noticed the queue on the box office has stretched out into the street. I stopped the car in front of the Cinema to discuss our options with my companions. People left the queue and gathered around my car. Their number increased rapidly. The situation quickly got out of hand. Somehow I managed to move the car slowly, maneuvered it out of the crowd and we returned back home. Najat: It was upsetting, but also nice! I would have been more upset if they did not take notice of me! This is called tax of fame! Since then she seems to have avoided further TV interviews and minimized her contact with the Press. She said that her performances should speak on her behalf. Najat stood on stage at the age of 5 years and retired from it 59 years later. Najat broke-away from imitating other singers when she released her own first song in 1955 at the age of 16 years. In mentioned 1964 interview, Najat herself indicated her first song was “Why did you allow me to love you?” Thereafter she released several other songs for Radio stations. Each song had duration of 7 to 8 minutes. She then delivered “long-duration” songs. Each of these songs tells a story and each typically lasts for some 20-40 minutes in Studio recordings. 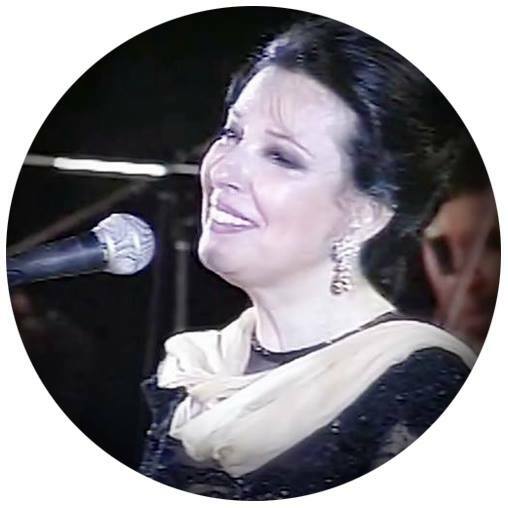 To hold onto her audience for the longer durations on stage Najat turned her attention to people like Nizar Qabbani. His classic poetic styles combine simplicity and elegance in exploring themes of love and feminism. She has sung at least three of his poems all of which were composed by Abdul Wahab. These long duration songs were highly successful and promptly elevated her to Um Kalthum popularity. Her success with long duration songs was phenomenal. She built on this success in subsequent years, despite the difficulty of finding new outstanding poems and corresponding music compositions. To combat this shortage, she was forced to rely on her own abilities in performance. For example: in 1976, she, at the age of 37, conducted several songs in her last film “Dried Tears”. One of these songs was “Mata?” derived from the poem written by Nizar Qabbani with music by Abdul Wahab. The duration of this song in the film was less than ten minutes. In the years that followed, Najat sang it several times on stage; the last time was in 2002. One of those repeats was in the 1980s when she was in her 40s. Her performance on stage lasted for almost one hour! In this performance, she extended the delivery of this same song from below 10 minutes in the film to about one hour on the stage. Many consider this specific performance on the stage was one of her life-time bests and I agree! It was recorded and can be easily found on YouTube. I could not ascertain exact date of this concert. Najat made 13 films then retired from filming in 1976 at the age of 37 years. Nearly, all of her films contained songs performed by her. The best of these films are those where she has the starring role. These seven films “1958 Stranger, 1962 Black Candles, 1966 Beach of Fun, 1969 Seven Days in Heaven, 1971 My Dear Daughter and 1976 Dried Tears” fall into that category. There were many composers other than above mentioned Kamal Al Taweel who composed “Live with me” and Abdul Wahab who composed her best hits including “Do not lie”. Baligh Hamdi (1932–1993) who composed “I am waiting for you”. 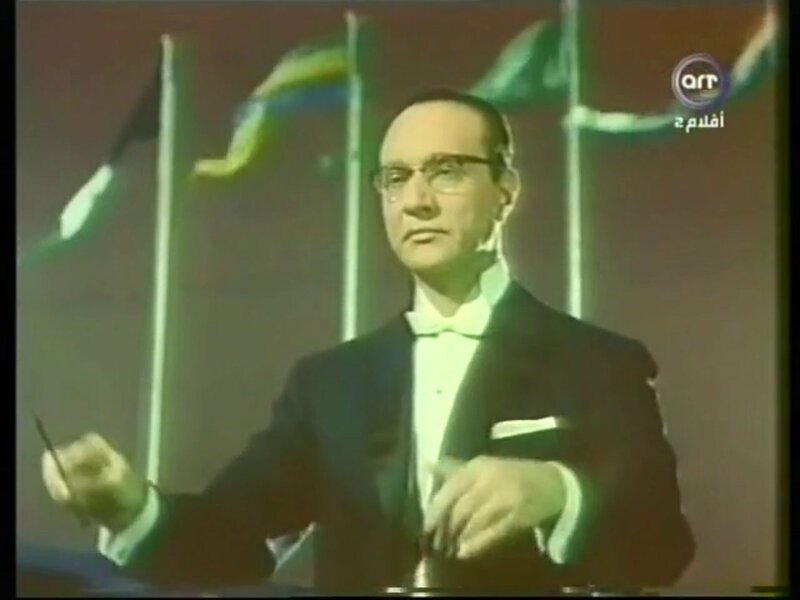 Syed Mekkawy (1927–1997) who composed “It makes a big difference”. 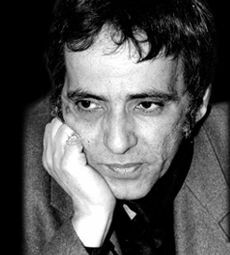 Mohammad El Mougi (1923–1995) who composed “Eyes of the heart”. Composers of earlier songs Riyad Al Sunbati (1906–1981), Mahmood Al Sherif (1912-1990), Hilmy Bakr (born 1937) as well as Zakariyya Ahmad (1896–1961). The list of song writing collaborators may have been even longer than that for music. Besides Nizar Qabbani, other famous Arabic poets and song writers of the 20th century also obliged Najat; such as Maamoun Shennawi (1914-1994) who wrote “Your love is my life” and his brother Kamal Shennawi (1908–1965) who wrote “Do not lie”. 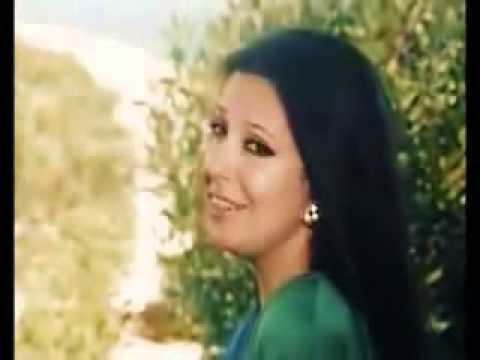 Also, both Mursi Jameel Aziz (1921-1980) who was one of her favourite song writers and Hussain Al Sayed (1921-1983) wrote several beautiful songs for Najat. Najat, as she herself confirms in that 1964 interview, always sought quality in words. She was extremely cautious with and meticulous in her choice of her lyrics. 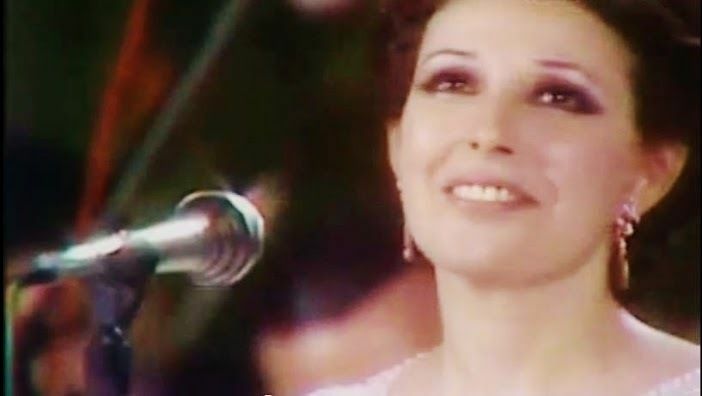 One example is that she replaced several words in and even deleted possibly more than one line from “Mata?” the original poem by Nizar Qabbani before she agreed to perform it! Well that was where Najat put her powerful signature. Her rigorous training, lengthy rehearsals in the recording studios and tireless performance on the stage are legendary. Training Session (1960s-1970s: Exact Date of Photo is Unknown), from left to right: Mahmood Affat on flute, composure Mohammad Abdul Wahab, Najat Al Saghira, and musician group leader Ahmad Faud Hasan). 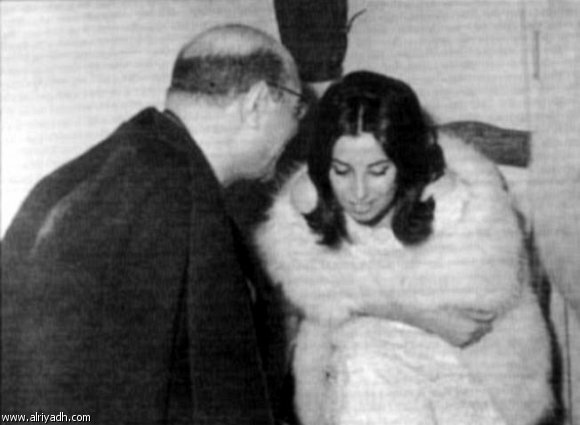 Fairuz (born 1934), and others. Shadia alone appeared in 114 films most of which contained songs by her. 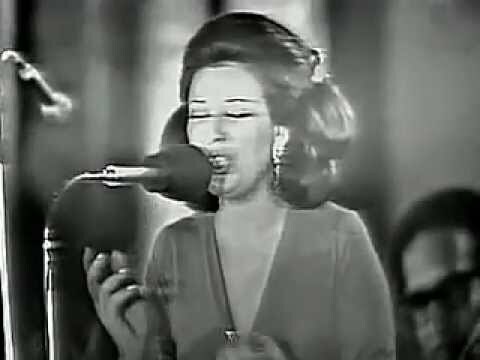 From the start of the Sixties, Najat quickly became a category on her own; separate from the others. According to Arabic media sources Najat has commented on the difficulties and intricacies of her Art form and her collaboration with poets and music composers “The road was not easy or laid with flowers as some people believed it to be. There was hard work in achieving those songs. I, the song writer and the music composer was watching every signal big or small. We were greatly daunted by the need to achieve success in front of massive audiences to the level of obsession in order to ensure there were no mistakes or omissions in the song. At the same time and in respect of my part; I must be at the level of the poet who invested so much effort in the words and also rise to the musical sentence of the composer. My voice had to bear the responsibility of carrying all of the words and musical components. All was for the sake of producing the emerging song to the public in the most desirable-perfect form“; (imperfectly translated). In 1960s, President Gamal Abdul Nasser (1918–1970) awarded her a high ranking Medal. She had, and still does have, many fans in Tunisia. Both Tunisian Presidents Habib Bourguiba (1903–2000) and later-on Zine El Abidine Ben Ali (born 1936) gave her awards. In 1985, King Hussain of Jordan (1935–1999) gave her the First Degree Medal of Independence. In 2006, some four years after her retirement, she won the prize for “Those Who Gave People Happiness” in Dubai being a Gold Medal and US $100,000. Where and how is Najat now (2015)? I do not know where she is. It was reported in the media that she went to Makkah and has been in Hijab since her retirement. To my knowledge, she has not been seen on screen or in public since 2006! 2006 : Najat at the age of 67 years! In 2010, a reporter confirmed that she still lives in Cairo but travels to London in summer for medical treatment. In 2014, at the age of 74, she made a phone call to an Arabic TV station. She was talking from Germany where she was receiving medical treatment. In 2015 (spring), social media chatter indicated she was receiving physiotherapy and there were some concerns about her health.